It’s almost here. A new kind of mid-size pickup truck, with Best-in-Class towing and payload, and legendary Jeep 4×4 capability. It’s the all-new 2020 Jeep Gladiator, the only open-air pickup truck in the industry. But what makes the Gladiator so revolutionary? For starters, it can tow up to 7,650 pounds, more than any other truck in its class. And the Gladiator comes out on top with up to 1,600 pounds of payload, the best in its class. Aside from superior performance, the Gladiator offers some unique features that you won’t find on any other truck. The doors and roof all come completely off, making it the only open-air pickup truck around. The windshield even folds down for the ultimate off-road experience. The rear box is set low for easy loading and unloading, and the lower tailgate is designed with off-roading in mind. You can even prop the tailgate half-open with built in cleats. The available Tonneau Cover is incredibly versatile. Weekend Warrior Mode allows you to open up a small section in the rear, letting you carry more in the bed while still keeping the cover taut. No other pick-up truck even comes close to the Gladiator’s off-road potential. Along with Jeep’s legendary 4×4 capability, the Gladiator offers a front-facing off-road camera. The camera looks two feet in front of the grill, allowing you to easily see and maneuver around obstacles. It even comes with a washer nozzle to keep it clean. It doesn’t skimp on interior comfort and functionality either! Available rear seat storage is removable, lockable, and perfect for storing gear or sports equipment. The seats fold up or down for maximum storage versatility. There’s even an available removable Bluetooth Speaker that recharges in the truck, so you’re always ready for a good time in a Gladiator. 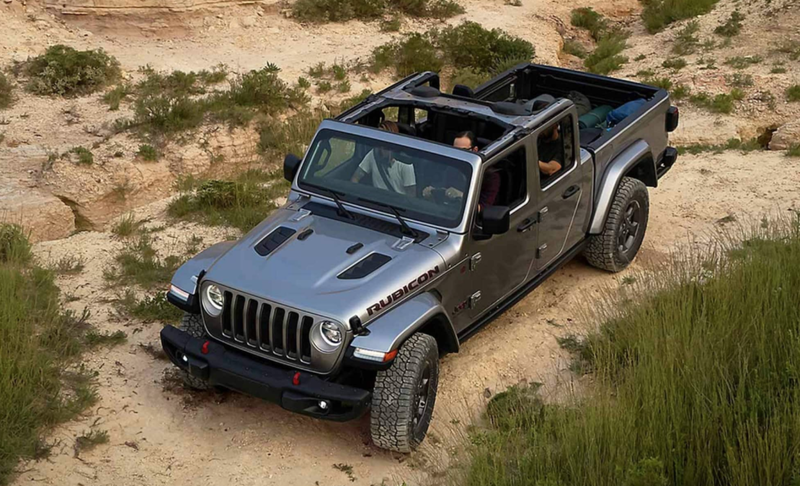 The 2020 Jeep Gladiator will be hitting the lot this spring, so be sure to check in with Freedom Jeep Chrysler for all the latest news on this revolutionary truck! Come see us for all of your Jeep buying needs in Killeen, serving Austin, Georgetown, Round Rock, Fort Hood, Waco, Temple, Belton, Harker Heights, and Copperas Cove.